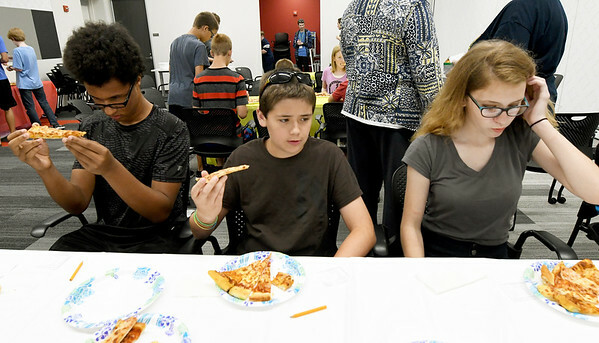 from the left: Pizza connoisseurs Jermaine Loum, 13, Korbin Howard, 13 and Emily Doebele, 14, critique pizzas from five local pizzerias during the Joplin Public Library's Pizza Taste Test on Tuesday afternoon. Pizzas were judged in five categories: Crust, Cheese, Sauce, Aroma and Overall. Local businesses contributed about 30 pizzas for the 35 judges.